It’s not quite as disgusting as a ‘fatberg,’ but it’s a whole lot of beads. The colorful beaded necklaces that are a signature of New Orleans’ annual Mardi Gras celebration have left the The Big Easy with a big mess. City officials say that more than 46 tons -- or 42,000 kilos -- of Carnival beads were among 7.2 million pounds of trash pulled from clogged catch basins along a five-block stretch of a downtown parade route, the Times-Picayune newspaper reported. The removal was part of a four-month project in response to heavy flooding in the city in August, the newspaper reported. The effectiveness of the city’s drainage systems came under fire after an Aug. 5 storm dumped up to 15 cm of rain, causing street flooding and underpasses to fill up. The clean-up effort between late September and late January cleared about 15,000 of the city’s estimated 68,000 storm drains, the newspaper reported. 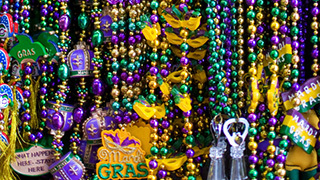 The Mardi Gras beads were concentrated along the St. Charles Avenue parade route. Mardi Gras is celebrated on Shrove Tuesday, the day before Ash Wednesday, which is the beginning of Lent, a period of reflection and abstinence on the Catholic calendar. 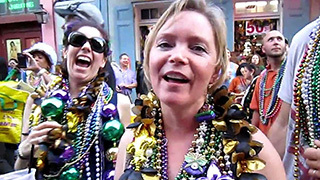 By tradition, Mardi Gras, which is French for “Fat Tuesday,” is a day that calls for uninhibited partying in preparation for the somber season of sacrifice to follow. Mardi Gras falls on Feb. 13 this year.